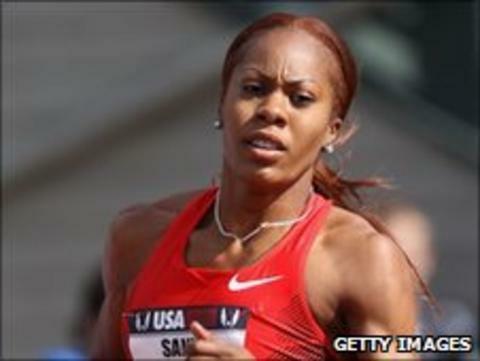 World 400m champion Sanya Richards-Ross is looking to use her appearance at the Birmingham Grand Prix to prepare for her World title defence in August. The 26-year-old American lost the whole of the 2010 season to injury after taking gold in Berlin the year before. After appearing in Birmingham on 10 July, she will travel to South Korea for the World Championships in August. "This year has been a different challenge from what I've had in the past," Richards-Ross told BBC WM. "I couldn't contemplate what I'd expect, it's been tough but I'm excited about the remainder of the year." The Jamaican-born athlete filled her year away from the track by spending more time with her husband Aaron, a cornerback for the New York Giants in the NFL. The pair met at the University of Texas and had their wedding filmed and televised last year. Now, after an injury-free spring, Richards-Ross is stepping up her preparations to defend her world title in Daegu, South Korea later this summer - and the signs are good after narrowly losing to the in-form Amantle Montsho in the Diamond League meeting in Lausanne last week. "Lausanne was my first time feeling somewhat like my old self and that was very exciting for me," she continued. "My training had been going so well all season, but I've learned being race-sharp is different from being training-sharp and so I really do hope to run much better in Birmingham. "It'd be nice if that would be my breakthrough race for the season." The women's 400m is set to be one of the most keenly contested events in Daegu with a host of medal contenders led by Richards-Ross, Montsho, Britain's Christine Ohuruogu and American Allyson Felix. "It's going to be an exciting race with Allyson and Christine and Amantle running as well as she is, and I'm sure the Jamaicans are going to start running great soon. "No-one's dominating the event - Montsho's running well but no-one's a clear-cut favourite this year. I really would have to go to Daegu as close to my best as possible." Richards-Ross will also take the opportunity to look around the Alexander Stadium facilities that will be housing the US track and field team for their pre-Olympic training camp next summer, and she is looking for her fastest time of the year on Sunday evening. "Absolutely, my best this year is 50.6 seconds and so I really do want to get closer to 50 flat, maybe even into 49 seconds this weekend. "I think I'm getting better with every race and hopefully I'll run into shape just in time." Richards-Ross faces stiff competition in Birmingham, however, as the field includes Ohuruogu, Montsho, American Debbie Dunn and the Jamaican trio of Novlene Williams-Mills, Rosemarie Whyte and Shericka Williams.